Shri V.S. 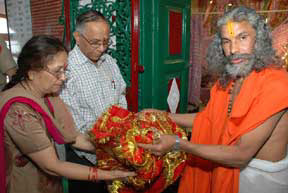 Kokje, Governor attended a Bhandara at the Shaktipeeth Tara Devi Temple near Shimla today. Earlier he performed pooja in the temple and paid obeisance at the lotus feet of goddess Tara the symbol of power and prosperity alongwith his wife Smt. Leena Kokje.Shri J.P. Singh, Secretary to Governor and all the staff members of Raj Bhawan also attended the Bhandara among hundreds of local devotees.